The goal of Project Pterosaur is to mount an expedition to locate and bring back to the United States living specimens of pterosaurs or their fertile eggs, which will be displayed in a Pterosaur Rookery that will be the center piece of the planned Fellowship Creation Science Museum and Research Institute (FCSMRI). 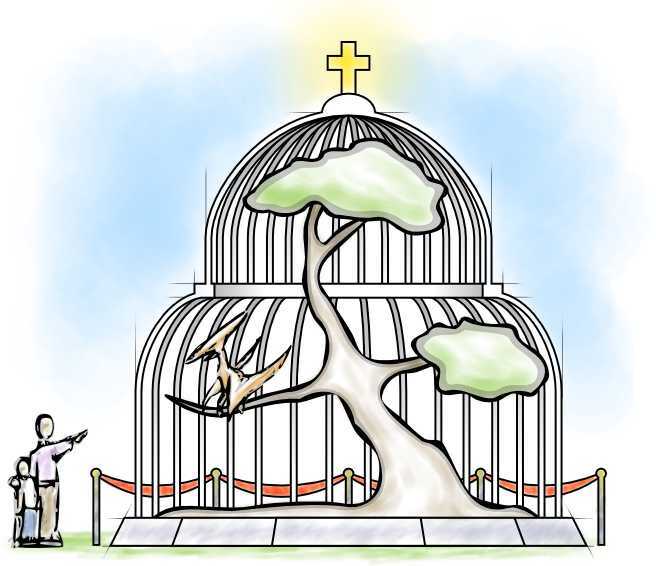 Furthermore, the rookery facility will establish a breeding colony of pterosaurs in order to produce specimens that could then be put on display by other regional institutions or church groups. Support Creation Theory by showing the incorrectness of the philosophy of Evolutionism. Educate the population about Creation Science. Create excitement about Creation and the Bible in the public. I (Dr. Paley) am the founder and Chief Officer of the project. I will also be leading the expedition and acting as Science Liaison to the public. Funding is being provided by Fellowship University, the Fairlight Institute, and donations from wealthy Christian businessmen who wish to remain anonymous at this time. Why Look For Living Pterosaurs? Kids love pterosaurs! Once Project Pterosaur is complete, children's eyes will be opened to the wonder of Creation. Evolutionists have engaged in a propaganda campaign to trick the public into falsely believing that the Earth is billions of years old and that many animals which lived side-by-side with Adam and Eve in the Garden of Eden actually died millions of years before humans were created (or "evolved" in their twisted view.) By finding and displaying living examples of what the Evolutionists claim is impossible, we will sow the seeds of Evolutionism doubt, thereby making the public receptive to the truth of the Bible. Apatosaurs: Still live in the jungles of the Congo. They are too large for our planned facilities (and especially for those of the church groups who would wish to borrow them) and breeding would be difficult given their presumably longer life cycle. Plesiosaurs: Are reported living in many lakes and their carcasses have been found in the oceans by fishermen. However, they are notoriously difficult to find alive and would require a large and expensive aquatic facility to display them. Trilobites: We know they still live in the oceanic depths from body parts that have been found washed ashore. They would require very expensive submersible vehicles and pressurized display tanks. Velociraptors: Today terrorize the goat herders of Puerto Rico and are rumored to guard the remains of the Ark on Mt. Ararat. They have become vicious since the Fall as the result of the effects of genetic entropy, making them too dangerous for the sort of interactive public experience we have in mind. In comparison, pterosaurs are a blessing from the Lord: Many reported living species are of reasonable size, making housing and care affordable; although they've become carnivorous, they should be as trainable as the birds of prey commonly allowed to interact with zoo visitors during bird shows; their life cycle appears to be relatively short, making it easier to establish a productive breeding program; and finally, historical and modern reports of pterosaurs are much more common than any of the other Evolutionistically anomalous cryptids, suggesting that large populations are waiting to be revealed to our increasingly unbelieving world. To better understand the project, please study the following chronological outline. By the Grace of the Lord, if all goes according to plan, we should have completed Phase III before this decade is out. Research possible pterosaur colony locations and plan expedition accordingly. Secure necessary supplies and permits for expedition. Locate and return pterosaur eggs and/or mature specimens. Ensure health and viability of specimens. A movie dramatization of the expedition (using a non-Hollywood production company such as Cloud Ten Pictures). Educational merchandise tie-ins (stuffed pterosaurs, Creation Science Explorers action figures, etc.). Finish rookery complex guest facilities and construct Creation Science Museum facilities. Open rookery and museum to general public (rookery may be opened sooner to capitalize on media attention). Breed pterosaurs and establish specimen loan/donation program for Churches and schools. Create Fellowship Creation Science Museum franchise/certification program. Develop or attract legal defense/reconstruction expertise through Research Institute. 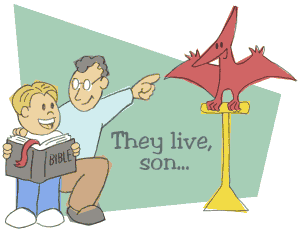 Use pterosaurs to educate public about Creation Science and expose the flaws of Evolutionism. After the spiritual and cultural renewal it will lead to, the second most exciting part of Project Pterosaur is the expedition. It is during this phase that we will go into the wild and see what the Lord has to reveal to us. What species of pterosaur will He grace us with? What challenges will He put us through so that we may grow both as Creation Scientists and as Christians? The unknown awaits us, but we are guided by Faith to see that the Glory of His Creation is shown to the world. The media coverage possibilities of this cannot be understated. Our current focus for expedition sites is in Sub-Saharan Africa, where numerous modern pterosaur sightings have been reported. This dark continent holds many secrets, and its large, unexplored wildernesses could easily hide pterosaur colonies. The area is reachable on wing from both Northeastern Africa -- which was home to the saraph pterosaurs of the Bible -- and with Mt. Ararat -- from which all postdiluvian life, including pterosaurs, was dispersed -- making it an obvious area to search for extant pterosaurs. Furthermore, I have experience in the region from my 2002 expedition to find living Apatosaurs. Another reason to choose Africa is that our expedition will have competition in the next most promising pterosaur location, Papua New Guinea. Dr. Carl Baugh of the Creation Evidence Museum has already led expeditions to PNG, and has found evidences of two types of pterosaurs there. He has secured permits from the local government to capture four living specimens and export them to the states as soon as he finds the funding. Also, Jonathan David Whitcomb has led PNG expeditions and collected local accounts and sightings of the so-called "Ropen," which he has recounted in his book Searching for Ropens and Finding God. There is, of course, nothing wrong with friendly competition, and we would like to be the first to bring back this incredible testimony to Creation. However, we don't wish to claim jump on Dr. Baugh, so we'll leave Papua New Guinea to him and his museum's team. I would say "May the best Creation Scientist win," but when either team finds pterosaurs, we'll all be winners. This remote and mountainous park is large (over 4000 square miles) and mostly unexplored, except by the few natives who live within its borders. On the park's southern boundary lies the highest peak in Nigeria, the 7936 ft. Chappal Waddi ("Mountain of Death"). This peak is near the border with Cameroon, where eagle-sized rhamphorhynchoid pterosaurs locally called olitiau have been reported. It is likely that the pterosaur population reaches into Gashaka-Gumti, as the cliffs of Chappal Waddi would provide an excellent roosting habitat and the park's many mountain forests would keep them fed with fresh monkeys. There have been numerous sightings of pterosaurs circling Mt. Kilimanjaro, the tallest mountain in Africa. It is likely that they roost among its steep, inaccessible cliffs. Although reports are unclear, the pterosaurs are probably pterodactyloid, as their larger size will help protect them from the colder climate. However, it is likely that allied rhamphorhynchoid kinds could be found at lower elevations. Technical note: choice of this location will require mountain climbing gear and hiring of experienced alpinists. 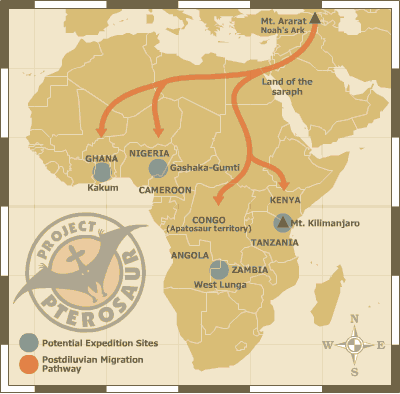 Northwestern Zambia was the source of the first modern African pterosaur reports to reach civilization in the 1920s. West Lunga National Park is in the same area as those reports (the Mwinilunga District) and has many swamps, which are the natural habitat of the native kongamato pterosaurs. The park is relatively isolated and much undisturbed wildlife can be found there. Local legends confirm the existence here of a pterodactyloid creature called the sasabonsam and it is likely that smaller rhamphorhynchoids could also be found. Ghana is home to many heavily forested parks that could contain pterosaurs. Kakum National Park, with its network of forest canopy walkways allowing greater pterosaur spotting opportunities, is the most attractive from a pterosaurlogical perspective. However, we are also considering Bui National Park, both for it's biomic compatibility with pterosaur-like bat populations and since Halliburton is building a hydroelectric dam there. Halliburton's presence means we can expect better access opportunities through the synergy of private sector and faithbased US government initiatives. In order to organize an expedition of this magnitude, we need contacts in the region to help us secure necessary travel and exportation permits, provisions, personnel, and, most importantly, information. If you are from any of the regions being considered and would like to help us, or have information about another region that you think would be of interest to the project, please contact me at: richardpaley@objectiveministries.org. Our first and foremost goal is to serve the Lord and be prayerful in our actions. Pterosaurs are not to be harmed, nor are their colonies to be unduly disrupted, so as to preserve these evidences for future generations. If we find pterodactyloids that are too large to capture and bring back unharmed, we will instead take eggs and/or photos. Ethnological evidences of latent Biblical knowledge in native cultures from before the Tower of Babel incident should be recorded for use in study and museum displays. Non-Christian natives encountered should be made to know the Word and of the Saving Grace of our Lord Jesus Christ. A Missiological Technician will accompany the expedition to witness and perform Baptisms as necessary. Assembling a team is very important. While this is true of any expedition of this scope, there are certain technical needs specific to our expedition that merit special attention. Most obviously, we need a pterosaurologist to help identify the living specimens in relation to Flood remains and Biblical accounts. While not strictly necessary in the field, it would be helpful to have both an Intelligent Design theoretician and a baraminologist to assess in situ the specified complexity and baraminicity of any specimens we find. As mentioned in our protocols, we also need a missiological technician to take care of spiritual matters while the rest of the team is focused on pterosaurs. And finally we need someone with testimonial experience to document the expedition for use in live field reports and later TV specials. I have also contacted "Johnny" Kimbuso, my African guide from my last expedition, to see if he would be willing to help. It was he who managed to take the picture of the apatosaur we uncovered. Hopefully, I can convince him to join me again on another Creation Science adventure, although he still suffers trauma from his close encounter with the charging dinosaur. Nets, including large butterfly-style nets for use on smaller rhamphorhynchi. Climate controlled egg transport containers. Technical note: the Project Pterosaur logo should be placed prominently on all equipment where possible so as to promote the project name and associated educational and witnessing programs with the dissemination of expedition images. We will be consulting with logo placement experts from NASCAR for technical assistance. As per our outline, we will be using the excitement surrounding the expedition as the "hook" for much of the media campaign, which we will then be able to translate into an opportunity to both educate and witness. Because of this, it is important for us to document the expedition to allow the public to feel as though they were right there with us, experiencing the majesty and awe of seeing one of God's most magnificent Creations for the first time. When we start the expedition, we plan to allow our website visitors and students from schools and homeschool groups to track our progress almost in real-time using our PteroCam. We will also promote the expedition and later the museum through the use of a mascot, created by Peggy Miller, called Pteva the Pterodactyl. Merchandise, coloring books, and educational cartoons featuring Pteva will be sold in the museum gift shoppe and through licensing agreements world wide, helping to provide additional funding. 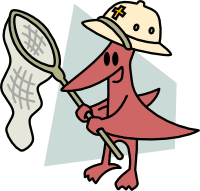 Younger children will be able to enroll in our Junior Pterosaur Ptrackers program, which will provide them with pterosaur literature, special gear, and behind the scenes information. They will also be encouraged to keep an eye out for pterosaurs in their neighborhood, because you never know if a Quetzalcoatlus might fly over your back yard! Be sure to check out our Pteva Flying Automata! Excellent Creation Science educational tool to prepare Sunday School students to care for their class pterosaur once our specimen loan program is up and running (see below). Pterosauriary display in Rookery courtyard will have perching tree so that visitors can view smaller pterosaur specimens in the round. The Pterosaur Rookery will be the cornerstone of the Creation Science Museum: a world-class pterosaur facility staffed by the top Christian experts in pterosaur care and husbandry (who will be trained at the very same facility, since little is currently known about pterosaur needs). 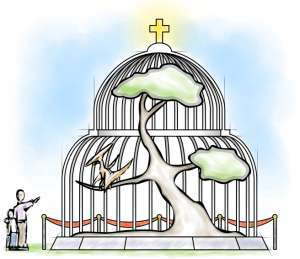 The rookery will breed pterosaurs for study, conservation, and use in franchise Fellowship Creation Science Museums and our planned inter-Church specimen loan program (see below). Besides behind-the-scenes breeding and veterinary programs, the rookery will also feature specimen displays open to the public. First stocked with our initial pterosaurian find, these pterosaur aviaries (or pterosauriaries) will later house many different pterosaur kinds and subkinds -- discovered from around the world by future expeditions conducted by Fellowship University -- to delight our visitors and inform them about baraminology and the effects of post-Fall genetic entropy. Additional Rookery attractions we have planned are: a theater showing a documentary about the expedition, a trained pterosaur show, an animatronic display of pterosaur/human interaction throughout history, a collection of Deluge-era pterosaur fossils, a wandering performer in a Pteva the Pterodactyl costume to entertain children, and a gift shoppe. The FCSMRI will go beyond just pterosaurs and will be an international center for both Creation Science research and educating the public. Combined with the Pterosaur Rookery, the FCSMRI will be a destination for both scholars and lay vacationers alike and, unlike similar secular institutions such as the Smithsonian, it will be certified Family Friendly. The Museum section will feature many educational displays, dioramas, and interactive kiosks aimed at making Creation accessible to all -- including the unbeliever. Collections of Creation artifacts from around the world (including, of course, pterosaurs) will be put on display with interpretive guides to lead the public through the evidences to see Biblical truth. It will also host special exhibits and educational programs for homeschoolers. Additional Museum attractions/facilities we have planned are: an IMAX-style theater that will double as a lecture hall, a Noah's Ark simulator ride, a pool for baptizing those convinced by the evidences into accepting Jesus Christ as their Savior, and a gift shoppe. The Research Institute section will employ or play host to a staff of Creation researchers from such diverse fields as information theory, complexology, hydrodynamics, theobiology, and baraminology, as well as experts in the legal defense of both Creation Science and faithbased programs against anti-Christian organizations. The goal is to become a "Creation think tank" that will help lead research into new and exciting directions, as well as help shape public policy in order to make it more amiable towards missiological works. One of the goals of the Pterosaur Rookery will be to breed as many of the creatures as possible so that franchise museums -- for which we will have licensing programs -- can also put them on display, allowing people all over the country and the world to be able to experience evidences of the Lord's creation up close and in person. We will also offer programs to loan specimens to church groups for use in Creation Education programs, along with pterosaur experts -- whom we will train in a planned Pterosaur Handlers School -- to explain their biology and place in God's Creation. We will not, however, sell nor loan specimens to institutions that are Evolutionistic or of other disreputable persuasions, such the Smithsonian or the Anheuser-Busch Corporation, who would seek to use the animals to promote Evolutionism or some other form of disrespect to the Lord. These are God's Creations and they will be discovered by Godly people, so why should the forces of Godlessness profit by them?